The comics for today and Monday have been scaling jokes, but there's nothing funny about Scalable Vector Graphics. Well, there probably is but I can't think of anything at the moment. Due to the fact that I have a new baby at home (daughter number 4!) I haven't had as much time to work on code projects, but I have been trying to make some updates to my personal website whenever I have a few minutes. Much like my comics, I want to make use of SVG images of frogs on it. Really big, in-your-face frogs. Frogs that scale perfectly even on retina displays. The downside to using SVG images is that they can easily become bloated. Sure, if you want a really large image it's almost always better to use an SVG instead of a "normal" image format. And since they are just XML text they compress well. But Inkscape puts a ton of extra stuff in them that doesn't really need to be there - removing all the unnecessary information can make the files even better! 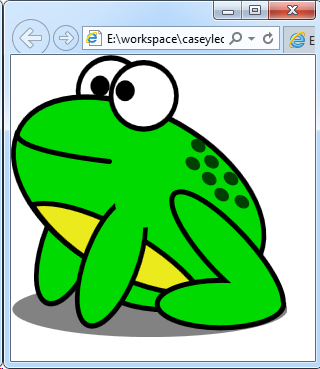 There are some web-based tools for cleaning-up SVG files, but the ones that I tried were not able to process my frogs without destroying them. But then I found SVGO, the SVG Optimizer for Node. This image is the original file, frog.svg. ...and this image is the optimized file, frog.min.svg. See any differences? I don't. And the optimized one is only 5k, whereas the original was 15k. When I get a few more minutes, I intend to embed it in the workflow of adding or updating images for the comic. Once I do that, all SVGs that I create in Inkscape will be automatically optimized when I upload them before they are stored in the database. This should improve the download times for my comic as well as the render speed since there is less XML for the clients to process. Not that the comic takes that long to load now...the server does gzip all the files before sending them as long as the client supports it. See for yourself by viewing the comic!